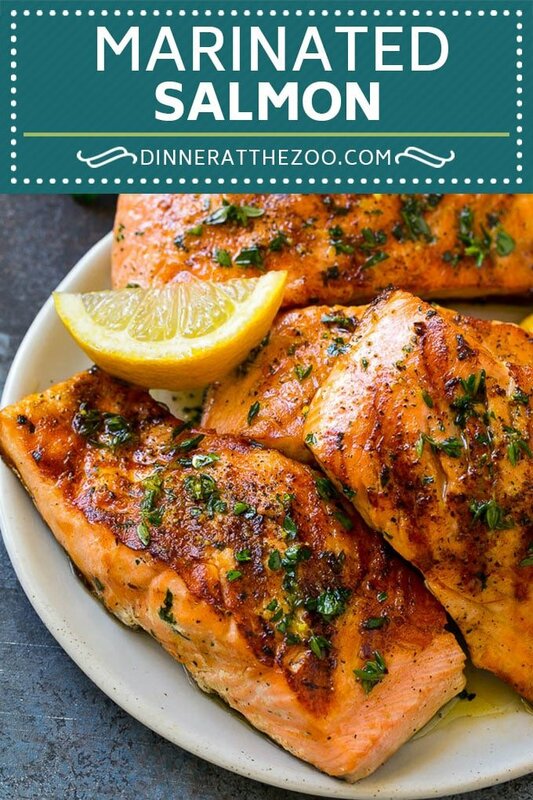 This marinated salmon is fresh salmon fillets flavored with olive oil, garlic and herbs, then grilled or baked to perfection. 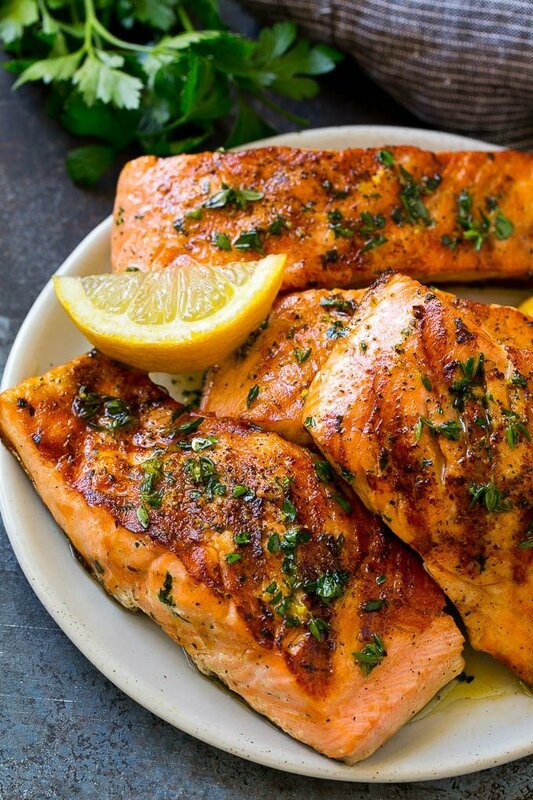 You’ll want to grill salmon all summer long after you taste this easy marinade! Salmon is the perfect fish for grilling – it doesn’t fall apart and it doesn’t dry out. When you add a simple yet flavorful marinade to the mix, you get a crowd pleasing dish that will end up on your permanent dinner menu rotation. For me, summer is all about grilling, and one of my favorite things to grill is seafood. I make this marinated salmon constantly during the warmer months and there are never any leftovers. Even my kids love this one! How do you make marinated salmon? 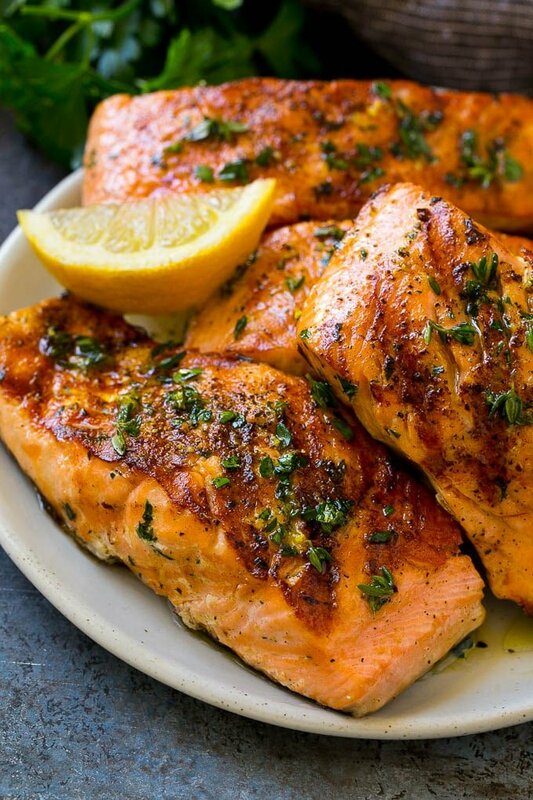 The marinade for this salmon is a mixture of olive oil, honey, soy sauce, lemon zest and herbs. The salmon sits in the marinade for up to 6 hours, then is grilled or broiled to perfection. I intentionally left lemon juice out of this recipe because acids like lemon juice can actually “cook” the salmon as it sits in the marinade. The lemon zest adds tons of citrus flavor without the risk of changing the texture of the salmon. This is a simple recipe, which means that it’s best to buy the highest quality salmon you can afford. Fresh salmon often tastes better than frozen salmon, and wild caught salmon is healthier and more flavorful than farmed salmon. Don’t have salmon fillets? 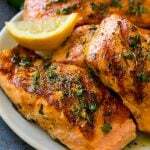 Salmon steaks will also work, or try marinating a whole side of salmon and baking it in the oven. What is the best seasoning for salmon? My favorite way to season grilled salmon is with a combination of lemon, garlic, fresh herbs, salt and pepper. You can use whatever herbs you have on hand. This recipe calls for parsley and thyme leaves, but other great choices are chives, oregano or dill. Don’t have fresh herbs in the house? Try a teaspoon or two of a dried herb seasoning blend such as Italian seasoning. 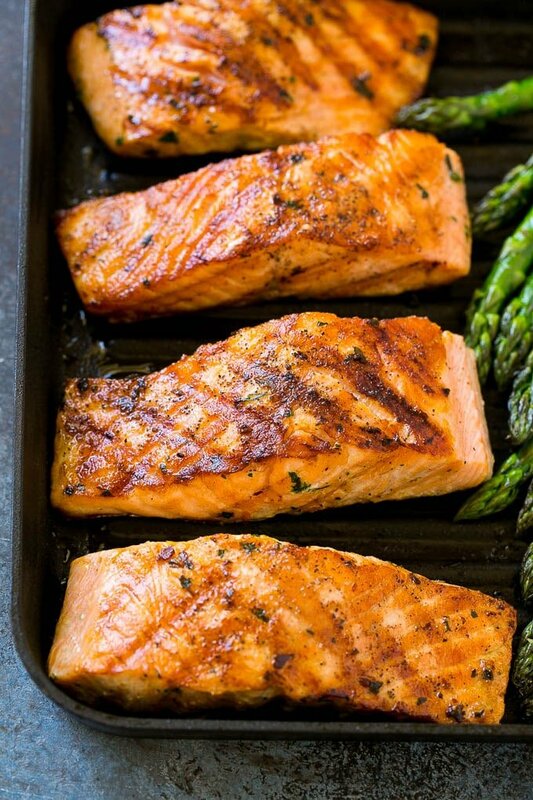 You can grill salmon either on an outdoor grill or an indoor stove top grill pan. It’s important to leave the skin on the salmon so that the fillets will hold together and not fall apart on the grill. Typically you’ll want to cook the salmon for 5-6 minutes per side, but this time can vary depending on the thickness of your salmon fillets. I often add some vegetables to the grill at the same time, such as asparagus, zucchini, or corn on the cob to round out the meal. The finishing touch on this marinated salmon is a drizzle of reserved marinade. It adds so much extra flavor! I serve my garlic herb salmon over rice, mashed potatoes or pasta, along with some veggies for a complete meal. This grilled marinated salmon is easy enough for a quick weeknight dinner, yet elegant enough to serve to company. 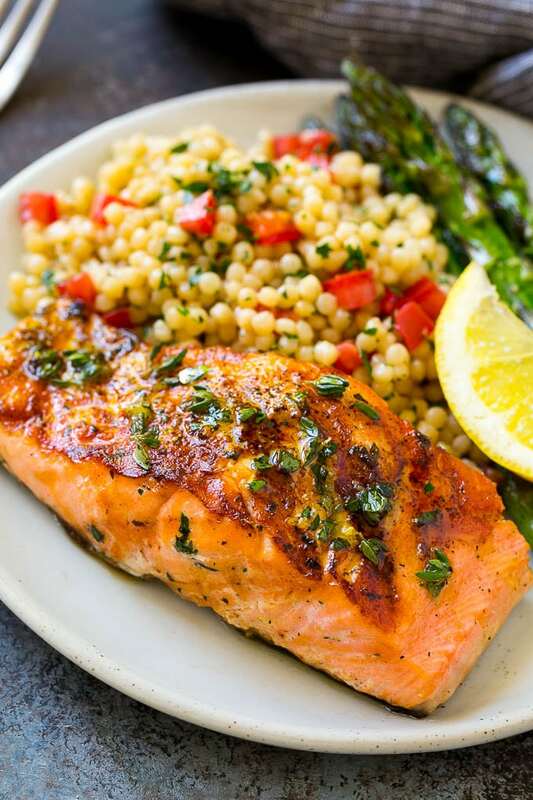 Whether you grill or bake your salmon, everyone is sure to love it! 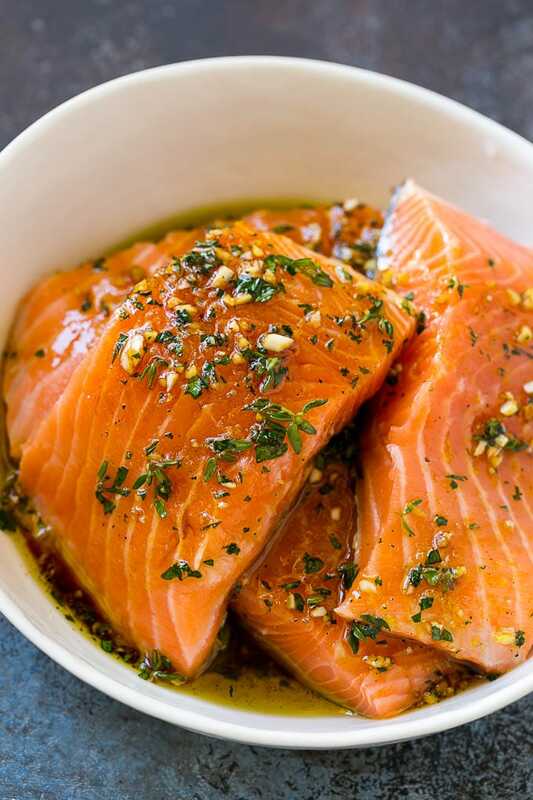 This marinated salmon is fresh salmon fillets flavored with olive oil, garlic and herbs, then grilled or baked to perfection. You'll want to grill salmon all summer long after you taste this easy marinade! Place the olive oil, honey, soy sauce, lemon zest, parsley, thyme, salt and pepper in a bowl. Whisk to combine. Reserve 1 tablespoon of the marinade for later use. Add the garlic to the bowl. Add the salmon and marinade to a resealable freezer bag and seal. Shake to coat the salmon with the marinade. Marinate in the refrigerator for at least 30 minutes, or up to 6 hours. Remove the salmon from the marinade and scrape off any excess bits of herbs or garlic (otherwise they could burn on the grill!). Grilling instructions: Preheat an outdoor grill or indoor grill pan over medium high heat. Add the salmon fillets and cook for 5-6 minutes on each side or until salmon is opaque throughout. Oven instructions: Preheat the oven to 425 degrees. Place the salmon fillets on a sheet pan lined with cooking spray. Bake for 15 minutes or until salmon is cooked through. Brush the reserved marinade over the salmon fillets, then serve with lemon wedges if desired. I just love this recipe! So good and easy! I make it for company and they are always impressed. can you use bay leaves or ground Thyme? Either would be a good choice, I’d just use one bay leaf in the marinade so it’s not overpowering. I was looking for a different marinade for salmon as I eat a lot of salmon. OMG, this was awesome. I wanted to grill it outside but it was raining so I used my George Foreman. Wow, what flavors. Hello, Is there much difference in taste when grilling vs baking the salmon? Trying out soon, but I’ll be baking it. I would broil it for a similar flavor! Delicious marinade! Easy to whip together and enjoyed by the entire family. This is the best marinade ever!! I ran out of time and just coated the salmon with it and after cooking I poured a little more over and my husband raved over it! THANK YOU!! This is a must make as I LOVE salmon and always looking for a new recipe and this looks so good. Oh wow! that’s truly mouth watery, I like this recipe a lot! Thanks for sharing the video it would be easier to follow. I love salmon so much! I really think lemon brings out the taste of the salmon really well and garlic makes everything taste better! This looks so good! I’m usually not a big salmon eater but this looks delicious. I’ll have to try it out sometime, thanks for sharing! I honestly do not like seafood one bit, but this looks AMAZING!!! I’d like to try this same recipe but with chicken breast!! My husband loves salmon so I’ll share this recipe with him! This looks so delicious! Can’t wait to try it out at home. THe perfection that is this salmon, is UNREAL. Seriously. you cooked it absolutely amazingly!!! I really want in on a piece or two! Wow, I do love salmon a lot, actually this is one of my favorite and this salmon dish recipe looks so delicious and so simple to make. I will definitely try this at home for my family dinner. This looks like it tastes amazing, I can’t wait to show my husband. We love trying new new dinner ideas. Found this website yesterday and made this for dinner last night. It is delicious! Even my two young children loved it:) I will definitely be cooking more recipes from here. All look and sound great and love how quick and easy they can be made. Super Awesome! So glad to hear you liked it, my kids loved this one too! 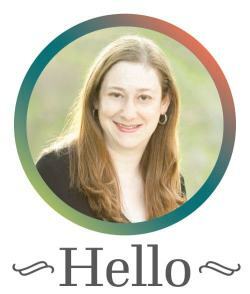 I hope you come back to visit soon, I post a new recipe every weekday!